Orange Hat is a band that refuses to follow any fads or trends; content to just follow their own psychedelic pied piper. 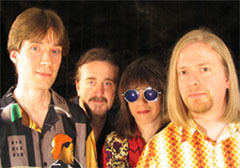 Although the band itself describes their music as ‘psychedelic’, one of the strengths of the music of Orange Hat is the heavy influence of power-pop in the songwriting. And if catchy songs weren’t enough, the band also excels in the visual format, having produced a full-length video, a TV series and the release of their first DVD (some episodes of their TV show). However, after the release of their PUFFERFISH CD, the band experienced a membership shake-up, losing half their lineup (luckily it WASN’T the songwriting/singing half), with keyboards and drums gone. They have since replaced the drummer and found a second guitarist. I was curious as to how this would effect the Orange Hat sound, since keyboard was featuring prominently on PUFFERFISH. E.C. : O.K., my first question is a multi-part one. I want to ask you about the membership changes in Orange Hat. Gone are Jason Nesmith on the drums and Kenny Howes on vox organ. In is Lee Flier on guitar and Eskil Wetterqvist on drums. What led to the change of players, how did you recruit new personnel and most importantly, how has it (if indeed it has?) changed the direction of the band? I mean, now you have two guitars and no organ - to me, a big part of that distinctive Orange Hat sound (at least on PUFFERFISH) is that organ. Will that instrument be on future recordings, or are you guys going for a more guitar-based sound now? The band is based in Atlanta. In the last few years, Jason has moved to Athens,GA and Kenny has relocated to Southern California, so the lineup change was a purely practical one. They both still get dragged into our video madness whenever they venture back into Atlanta. The Vox organ will not be on any future recordings until someone gives me one. Lee introduced herself to Orange Hat at a gig, and we met Eskil through her. Zeus and I have an Orange Hat writing style that has developed over the years, but it's nice to have the songs interpreted by the musicians in the band. Then the beast lives and Dr. Frankenstein gets to yell "Yahtzee!!". Yeah, the gelatinous goo of the new band's sound is beginning to gel nicely. You'll all get to taste it soon enough. E.C. : How did the video aspect of the band come about? Did you study film seriously? When you started Orange Hat with Zeus, did you envision the band having a visual side as well? Or did the music come first? Christo: When I started making home recordings and calling myself Orange Hat in 1983, I also made 8mm films to serve as the music video for some of the songs. I recruited my friends from school to dress up and act silly in front of the cameras. MTV was really beginning to become ubiquitous and omnipresent at that point. So, the video aspect was always there. Then a couple of years later, I met Zeus who had shot some ridiculous videos for his songs with Fisher Price toys and other nonsense, so we hit it off nicely. I'm a professional video editor, but I didn't go to film school. I went to architecture school to learn how to build better films. E.C. : When I first saw your "Psychedelic Elevator" video and your "Orange Hat Hour" DVD, I immediately thought of the Monkees ala 1967, just when they started to delve into the more surreal aspects of psychedelic TV. What inspired you visually...what films or TV shows influenced the way you film the band? Christo: Yeah, Beatles movies and the Monkees TV show/movie are a pretty obvious lighthouse beacon for those of us trying to sail the seas of boredom. Just imagine Salvador Dali filling in for the vacationing weatherman on your local news channel. As he reads the record high temperature for this date in 1822, we realize that his blue necktie has caused him to seem partially transparent on the chromakey. Through the hallucinogenic hole in his chest the burning giraffes have been set free. E.C. : My son was watching when I first screened your video and DVD. He especially liked the humor, while I was more drawn to the music videos! What is your target audience visually? Christo: Actually, we are our own target audience. We just create stuff that WE would like to see and hear. I'm always pleasantly surprised when someone else enjoys it. We've had people from 7 to 70 years old dancing around at our gigs. We definitely don't make "children's records", but a lot of people tell me that their kids really dig our videos and music. Maybe we could be the next Teletubbies! The beauty of being an "independent artist" is that we don't have think about a target audience. Any audience is fine with us. E.C. : There have been 50 episodes of the "Orange Hat Hour". How do you keep coming up with ideas for the show? Is it just shown on access TV? Will there be wider distribution? And finally, are there plans to resurrect the series with the new lineup? Christo: When I was producing the show on a weekly basis, the ideas came from me and the members of the constantly evolving cast. Because of the weekly schedule, a lot of segments were stream of consciousness improv and giddy chaos. But, there were also some pretty great ideas that were somewhat scripted in advance. Local artists and musicians were eager to jump in and create outrageous characters. The Orange Hat Hour was shown on cable access in the Atlanta area for over a year. Original music videos from Orange Hat, weird art films, and surreal comedy skits were all thrown into the stew. The show now takes the form of an hour-long special every season (3 per year). We hope to release each of these specials packaged with a new 4-song EP. But, no more WEEKLY show...or my head will explode. E.C. : Orange Hat seems to have a different take on psychedelic music - you seem to lean more towards the pop-psychedelic music of The Strawberry Alarm Clock and HEAD-era Monkees, rather than the 'serious' psychedelic music of Pink Floyd. On your website, you describe your music as "twisted pop". Musically, what are your influences? Is your band psychedelic or pop? Or both? Do you write the songs with "visual" intent? Christo: Wow, your question has caused me to become disoriented. Where are my pants? We have performed 'Incense and Peppermints' and 'Interstellar Overdrive' in public before. We dig "Piper at the Gates of Dawn" - is it considered serious? We're not big fans of "The Wall". We don't do drugs, but we're addicted to coffee. But, NOT the kind of coffee that goes through a monkey first. I don't write songs to make videos out of them, but I do like for the listener to be able to visualize what's happening in the lyrics. Our numerous influences range from Beatles to Buckingham to Beck. Hopefully, at the end of the day, we sound like US. We just make cool, catchy rock with lots of sonic sprinkles on top. E.C. : Your band has a sense of humor in your music that you don't often find in psychedelic music. A lot of psychedelic bands just go for the 'strange' factor. Yet your lyrics deal with such humor as: psycho milkmen, people that melt in the sun, mentally unbalanced landlords, girlfriend exorcisms, and overloaded mood rings. What are your comical influences? Christo: Er, I think we just usually try to write interesting, memorable lyrics that tell a weird story. Orange Hat songs aren't usually meant to be "comedy". But, if your band isn't depressing, political, or melodramatic, writers like to send you and Zappa to sit in a special room with Weird Al. We like Al a lot, but just once we would love to be sent to Jane Wiedlin's room. Among other things, our TV show was influenced by Monty Python's Flying Circus and SCTV. E.C. : I saw that the songs on PUFFERFISH were copywritten 1999. Any plans to record new material with the new lineup anytime soon? Christo: We're recording right now in Lee's basement. Eskil keeps asking for pizza, but so far no pizza has materialized. New EP's are on the horizon! E.C. : I've noticed a pattern in the naming of titles. So far you've had: "Pork! ", "Pork Rinds" (video) "Pterodactyl Universe", "Pufferfish" and "Psychedelic Elevator" (video). I know this is a weird question, but why do your releases always start with the letter "P"? [The sole exception being your 7" single, "Humpty Dumpty / Entropy"] Is this an inside band joke? Christo: Yeah. That's a long running joke, I'm afraid. Our third cassette (the first with Zeus) was called "Paradox". Number four was titled "Profantasy" and our high school masterpiece was dubbed "Princess of Wails". Fearing the curse of Chicago's "Hot Streets", we decided to stick to the letter "P" for multi-song releases. There's no turning back. E.C. : I caught your gig at circle Sky Records on Nov 16, 2003. Someone in the audience told me that this was your only live appearance in 2003. Was this because of the lineup change? Are you guys going to play more live gigs this year? Finally, what is the future plan for Orange Hat? More music? More videos/TV stuff? A tour???! Christo: At the moment, we're starting to record lots of new tunes and paint a picture with pixels for every song. All the musicians in Orange Hat have their fingers in a lot of other pies, so our gnarled schedules preclude any gigs other than the occasional house party. But, the DVD format combines multi-channel audio with video, and that has ORANGE HAT written all over it. So, no world tour, but look for our 3D pop-up smell-o-vision rock-n-roll movie coming soon!